My Journey Sunday 22nd April. Depression, men’s health. It’s ok not to be ok! Had a good day yesterday in the sunshine having a barbecue was very relaxing. Did not have the best nights sleep due to a sore back and an early wake up call from Barney. I sat in the lounge with the bbc news on, I can’t even tell you what the news was and it’s only 4 hours later. Not in the best state of mind today but I need to remember where I have come from and this is just a minor down in comparison. I’m sure as the day goes on I will lift a bit but remember it does not last, on the road to recovery you can have down days but it is few and far between than the deepest darkest days of depression. I will be ok. I am watching the London marathon and just thinking how brave they are for doing it and I’m not talking about the elite athletes, I’m talking about the charity runners, the average person doing what they can to support people out there their loves ones they may have lost, loved ones in recovery or for themselves it is a very honourable gift and they will all touch someone’s life today and hopefully help them. I hope one day I will achieve something like this for men’s health. I did some years ago manage the manchester 10k so it is in me to work hard and get running again. Well I have just wrote a bit of detail about taking care of your appearance and it did not save I just feel frustrated, gutted, fed up that all my thought did not save. I will rewrite it in the hopes it makes me feel better that i managed to change my mindset. Some 50 minutes later I am writing it again, it went something like this: in depression sometimes it’s difficult to sort out your appearance, what do I mean by this… men don’t shave, gel their hair, wash, dress in the way they used to, for me it was nice shoes/boots, jeans, nice t shirt and now I’m not really bothered what shirt I wear or which shoes go with the outfit (yes men do think about it aswell but just arnt as good as women in matching.) Anyway my issues mainly are shaving and gelling my hair to make my appearance “smarter” something i struggle with in my darkest days of depression and since my relapse last week but I did manage to do it today, I was alone and chilled so I just did it, I battled in my head do I do it or do I leave it but the good came over me to do it. I am glad I did it I feel a bit better about myself, about my appearance. Sat in the caravan feeling fatigued and in a low mood I struggled to sort myself out, I did however force myself to go for a walk to clear my head a good walk in the countryside is what I needed, So I decided to walk up Arnside Knott which for me is a mole hill compared to the mountains I hike up but not today fighting with my state of mind made it difficult but I battled through I am more tired from fighting with my thoughts than I am from the walk I just kept telling myself it’s my mind not my body and kept going. It’s a beautiful place overlooking Morecambe bay, the lakes and the mountain ranges where I hike up. I am now at ease, mind not racing, mood lifted a little and not feeling fatigued I believe it’s called endorphins that has been released in my body from the sweaty hike I just did. Now a walk back to the caravan through the farmlands and have a nosey at the new arrivals. On my way down back to the caravan I saw lambs, calfs, hens and managed to get a couple of cow selfies which my wife absolutely loves doing for some reason. I got back and felt totally different, more like myself (not totally but more) my mopd had lifted so i showered, hair gelled and got ready to leave for the langdales, I feel refreshed, my mental state is in a good place and I can say I won today, I can say I have won every day even the darkest days becuase I am still here, I am fighting and winning which is all I can do to recover. The journey over to the langdale was not the best in fact even before I got to the A6 and old man did not understand the rules of the road when on his side there are parked cars he has to give way, we nearly had pheasant for tea just shot out of the bushes I have no idea how I did not hit it and then there is a silly woman overtaking a cyclist on a blind bend with me coming head on, needless to say an emergency stop was needed by both a d the woman did not even acknowledge she was wrong. This left me with a 45 minute journey full of anxiety, I managed to calm down and was ok ish. So took Barney for a little walk before we got into the pub. Remember it’s ok not to be ok as long as you tall to someone just like I did this morning I spoke with Julia and made the decision to do something about my mental state, it’s far from easy but you have to keep fighting. Author Daniel Buck.Posted on Apr 22, 2018 Apr 22, 2018 Categories #depressionLeave a comment on My Journey Sunday 22nd April. Depression, men’s health. It’s ok not to be ok! My Journey Saturday 21st April. Depression, men’s health. It’s ok not to be ok! I felt empowered sending messages to wigan council and leigh journal about the hazardous conditions I mentioned in yesterday’s blog it is a good thing, not only to sort out the mess but for me also to feel useful rather than useless, to show I care even if my emotion does not fully show it. In the afternoon myself and Barney decided to complete the list of mundane chores and also add to it, which is a positive moment to remember, I just decided whilst the weather was nice I would mow the lawns; something i have been putting off, I felt good after it and so did Barney enjoying the smell of the fresh cut grass then Barney had a snooze in the sun whilst I relaxed listening to the birds and the feeling of the light breeze around me, it was quite peaceful. I just sat and took it in. It was sort of enjoyable. Bit difficult to describe the proper emotion. But well worth the note on the blog. People I have not seen for some years and I feel very blessed to have these people in my life. So our journey to the lakes was around 11am and it started off with traffic again, not even on the motorway but we are persevering as it is a glorious day and we need the rays of the sun. Alot of people do not know but not the North West of England many people suffer with low vitamin D deficiancy becuase of the lack of the sun. Something I did not know about until the doctor did blood tests on me, why am o saying this you may think well a low vitamin D deficiancy can cause depression it can also cause fatigue, low mood, Anxiety, tiredness and a few others Google it you won’t believe the benefits you can get from a supplement of vitamin D. Something I will be sticking to for a long time in the hopes if part of my depression is caused by my low vitamin D deficiancy I can help with with the boost of vitamin supplements. Well it is lovely weather at the caravan, Barney has been for a walk to the beer garden and now I’m sat on the decking with capital on enjoying the sunshine, yes I said enjoying. I always feel so relaxed here and it always makes me feel better to be in the countryside. Especially in Silverlade, Lake District. Probably my most favourite place on earth. Think Barney is too warm on the decking he’s asleep on his bed. I don’t think he will ever understand how much he has helped me through this struggle. Dogs just give absolutely everything for nothing in return and I am so happy to have his as my dog…. sorry Julia our dog. It’s barbecue time later and the neighbours are having a party, not bothered just hope they have a good time. Just as we will with my excellent culinary skills. I will enjoy the sleep tonight I almost always do as there is very minimal noise well apart from the owl. I hope everyone enjoys the sunshine in the North today it’s not often we get it. I will just like to say before I finish today’s blog and I have said it a few times it’s ok not to be ok as long as you talk to someone. I can’t reiterate enough how important it is if you are suffering in silence. Author Daniel Buck.Posted on Apr 21, 2018 Categories #depressionLeave a comment on My Journey Saturday 21st April. Depression, men’s health. It’s ok not to be ok! My Journey Friday 20th April. Depression, men’s health. It’s ok not to be ok! Last nights dicussions with Danny and Julia was difficult but this morning has taken a big weight off my shoulders. On top of which i managed to get an extra hours sleep which always helps. I can only continue to say it’s ok not to be ok as long as you speak to someone… it helps so much just give it a try and you will see, it may be tough at first but keep doing it and soon it will be easy to open up to random people if that’s where it takes you. 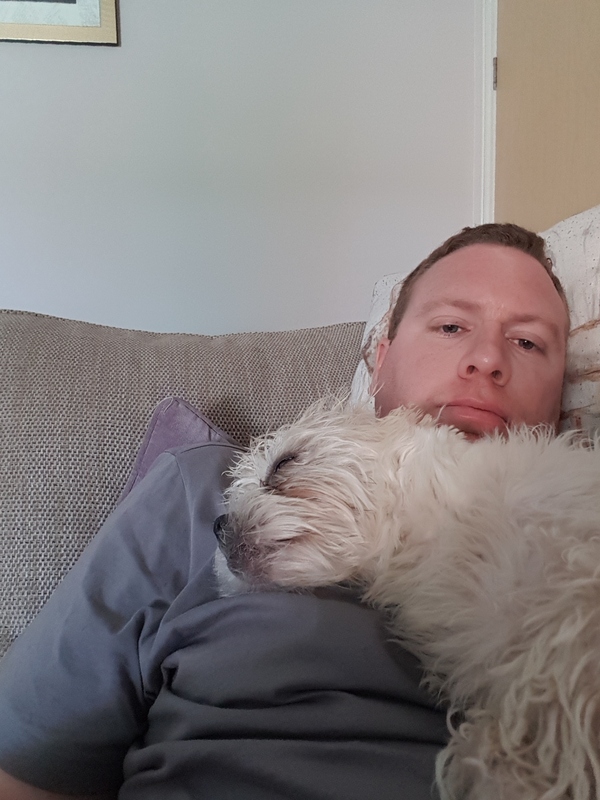 My list of things to do today is a but mundane but I have started on a positive and done the washing up and cleaned the kitchen, left Barney snoozing and walked into Atherton (my local town) did my football coupon, and picked up my perscription. I am currently sat behind the guide dogs building where it is peacful, the only problem is on the path down the litter is terrible, something that I am taking pictures off on my way back to sent to the local council, not only is it poor from humankind it can also cause problems for dog walkers especially the guide dogs. People should have more respect. Anyway I will leave that with the council. On my walk round Atherton I had a clear ish mind and I managed to observe everything around me, was a bit strange as usually I can’t do that but I noticed life… what do I mean about that, well life goes on, people carry on no matter what is inside, every person I looked at seemed normal and I’m sure I did to them but they don’t know my journey, my struggles and I don’t know theirs…. which is ok as some people don’t wish to share feelings with strangers but imagine if they did; imagine if the normal thing would be to talk to a random stranger and I don’t mean just say good morning isn’t it a lovely day, I mean have a 5 minute discussion over nothing and everything. It would be a different society we live in. Social media has become our normal but 15 years ago I wouldn’t message someone on Facebook, Twitter etc I would walk round knock on the door, see people in the street have a small chat. Speak to family member about family members. There is nothing wrong with social media just I feel it is over used and this can take you away from the “real world”. Although saying that it also can be a tool to reach out to people for the good. On my walk my phone pretty much stayed in my pocket as I quite like the feeling I had observing, listening and understanding more about myself, about my condition, seemed a bit surreal but I do know what I experienced was “normal” , seeing learner drivers everywhere, not good a parallel parking (but who is at the start) this made me smile and remember my first attempt at a parallel park! Then I saw builders on the new housing estate having banter, enjoying what they do or so it seems to me as a passer by, then I had the sounds of scaffolding clanging as it’s being constructed, in the distance dogs barking, birds tweeting, I realised i stopped having my 100 mile an hour thoughts and I just focused on the here and now and what is around me. I know I may have come across this before but I have not. It was a new sensation or a sensation I forgot about, the sensation was peaceful/relaxed. As I felt this I decided to write my blog early to show a different side of what happens during depression. Now I have to take my photos and send them in to the council. Carry on with my list of mundane chores and of course play with the puppy. Please continue to read, like and share my blog I know it’s reaching people out there some from America and even as far as Australia I just hope it helps someone. Author Daniel Buck.Posted on Apr 20, 2018 Categories UncategorizedLeave a comment on My Journey Friday 20th April. Depression, men’s health. It’s ok not to be ok! My Journey Thursday 19th April. Depression, men’s health. It’s ok not to be ok! Last night I had a better nights sleep but still not enough, still thoughts i can’t shift, always random always in and out throughout the night perhaps it was becuase I had two difficult appointments today. Not sure though. Followed my routine this morning (from my list) took Barney for a walk onto the fields and a run round in the sunshine (remember I have a low vitamin D count so sunshine is good for me) my mind was clear the whole time what a fabulous distraction. Got home gave Barney more water and a sprinkle hosepipe wash (his first) was still ok until I came inside and started relaxing, was very tired and actually fell asleep for an hour. Woke up and felt bad, felt unsure about the upcoming psychiatric appointment. Made lunch and then sorted Barney out before leaving. Left my phone, wallet and bottle of water in the house must be becuase I was anxious must be becuase I was focusing on what will be? What if? Etc. When I got to the hospital I was calm I read the borough magazine (I never read don’t know what’s happening to me.) There was an article in there from a rugby league player who suffered with depression Danny Sculthorpe and it is very similar to my experiences. He now is an ambassador for it and is doing well, it made me think that what I am doing, writing this in the hopes people read it, relate to it and know they are not alone is all worth it. I did my therapy and came out feeling dreadful, not becuase of the therapy as such but becuase I shared more than I have ever done so before and brought up alot I wanted to erase from my memory. However I can’t to that so I need to learn to accept it and a way to deal with it I just don’t know how to yet but I will do with the support. After that I had a call from HML occupation health, it was meant to be a 30 minute call which turned into 50 minutes due to the complexity of the discussions. Something the lady was not ready for but did sort it out in the end. She was lovely and personally which me well (that was off the record as was some other things) again though after I felt bad, questioned myself of lots of things. Spoke to Julia and told her about it (she was still in school marking books) Barney was outside eating grass. Felt a bit better after speaking to her and decided to start writing my blog so I can process my thought more. I feel after writing this a little better, still not good probably on a scale of 1 to 10, 10 being super awesome and myself again I would scale it as 4. The 1 is my darkest day I had in depression. Not ready to go into that just yet but when I get better, get the courage to share, feel no shame I will share it again just in the hopes it will help other people out there in their darkest moments and the moments after on the way to recovery. Just had a walk to the shop and saw a few people laughing, smiling genuinely looking good, peaceful but who truly knows… Made me think though I am not ok I am not there but I want to be I want to fight on and beat this. Get back to the person I used to be whatever or whoever I was I just know I did not feel like this. Later my best mate is coming round to I can download all of today and my plans to him for his opinion. Take some of the burden away from Julia although I know she says it’s not. My mental thoughts say it is and will not change until I am better. After that I will go through my list again ready for tomorrow I just hope I get more sleep tonight. Remember it’s ok not to be ok as long as you speak to someone. Author Daniel Buck.Posted on Apr 19, 2018 Apr 19, 2018 Categories UncategorizedLeave a comment on My Journey Thursday 19th April. Depression, men’s health. It’s ok not to be ok! My Journey continued Wednesday 18th April – depression, men’s health, it’s ok not to be ok! So i went to the doctors, it was tough, I decided to walk there, I left Barney in the house with a morning treat he was fine, I on the otherhand was a different story. On my way to the doctors I had time to think to breathe in the fresh air and calm down. When I arrived I though I am here again and would you believe the receptionist knew me and said take a seat Daniel you are next without me saying anything apart from “Morning” this surprised me surprised me becuase I usually never go to the doctors but clearly I have become a regular visitor. The doctor was not my usual GP and someone I have not seen before but I must say she was lovely a d very supportive asking me lots of questions, telling me it is ok these things do happen. She agreed to sign me off work for another 4 weeks to help look after myself. Yes look after myself this is probably the first time I have truly understood these words even though I have listened to family, friends and colleagues I have also said it myself but not truly understood it till today. I left the GP and walked home in the sunshine it was a lovely morning but I did not feel that emotion not yet anyway. I got game and Barney greeted me with the biggest cuddle and face licking (yes I know to some people this is not nice) but it was just the greeting I needed it lifted me made me feel that tiny amount better about myself. About is ok to not be able to do your job it’s ok that your partner (wife) is the main bread winner, that material things mean nothing if you well-being is not where it should be. His tought me this and I can’t help but think she truly loves me no matter what. I went to my mum and dad’s and sisters with Barney to take my mind off things talking to all of them really helped me, made me feel more normal. But what is normal? Everyone is different but you know when you are yourself again, which I felt, only in a small way but it was there the sign again you will be ok. Back to routines back to thinking about you and you alone hard to say as I think about family all the time but sometimes it has to be about just YOU. Once you sort yourself out you can then care for others do not put yourself you will be under too much pressure,family know you are fighting an illness and they just want you back. I left my sister’s and took Barney home who was snoozing in the car enjoying the breeze from the open window (don’t worry he is in a seat belt) I got home and I thought what do I do now so I looked at my post of jobs that myself and Julia wrote down the day before, this helped me I cracked on whilst Barney ate grass. The mother in law (called Gill I will use from now on) came around to drop the ironing off (yes I know we are lucky to have the ironing sorted) also a good excuse for Gill to see Barney. Barney was elated and kissed and played with Gill before relaxing on his bed. Ad I have not slept well for a good 4 days I had an afternoon snooze. I woke up feeling better feeling groggy but better. Soon after Julia arrived home and we had a good chat which helped fuether ease my thought my depression. I cooked tea, washed up and had a beer to relax somethijg that I ciuld.not have done in my darkest moments but I again used CBT and the support of Julia to crack on whilst she dis school work. (I did not share she is a teacher) and a bloody good one at that and I’m not being biase!! So now we are writing tomorrow list which includes psychotherapy. I will be nervous but I will be ok, I want to get better, I need the support. Author Daniel Buck.Posted on Apr 18, 2018 Apr 19, 2018 Categories #depressionTags #anxiety, #depression, #It'soknottobeok, #Men'shealth, Alone, Ashamed, CBT, Lost, Low mood, Mind, Psychotherapy, StressLeave a comment on My Journey continued Wednesday 18th April – depression, men’s health, it’s ok not to be ok! I am going through depression, I shared my journey so far on Facebook with all my connections, not for my benefit but in the hopes it helps others out there. Here it is with the added journey part two which I will link to social media through this blog in the hopes many more people can benefit or at least relate to it and know it is ok not to be ok as long as you talk. On the 9th January 2018 I lost everything. Booked in with the doctors straight away for support. Told my wife of my loss and received unbelievable support. I struggled to get out of bed, I lost all thoughts apart from very bad and concerning ones, I could not wash up, have a shave, put the bin out just simple daily tasks, things that seem so simple now and to many people all the time are simple things but if you suffer with mental health it’s so so hard and so so hard to share, especially for me always strong, always showing care, compassion and banter, not when this struck me down, however I have recovered massively with the support of my family, friends and Barney our puppy at my side and when I could not cope Julia did everything for me. It took weeks to share with my best mate as I was worried what he would think. No shame I know but at the time I felt dread. Months have passed by and with the support of family, friends, especially Julia, the NHS and my doctor I can say I am better not recovered but better and looking to return to work in the coming weeks. All I want to say is to anyone out there with depression, anxiety or any mental health issue YOUR ARE NOT ALONE and it is extremely important to share your thoughts as I did and it has helped me more than I knew it would have. It does not come on all of a sudden it gradually builds up, I still do.not know what or why I have been through this but I am working on it. There is no shame in it I realise this now and I want to say if anyone out there need to talk I am happy to support and share how I am recovering from what has been the worst experience in my life. Do not judge someone for their appearance you never know what they are going through. I posted on social media my journey and it had massive amounts of comments, likes and loves just to show it is ok not to be ok. I feel the message touched alot of people. Even someone asked my grandma how I was doing from the hairdressers, I know the person but won’t share the name. Very thoughtful and goes to show the message does work when you can talk about it. On the negative side which I am currently going through, I did my return to work on Friday 13th (you could say I was jinxed for that date). I went back to work on Monday 16th, the day before my thoughts of dread, rushing anxiety flushing through my body, sad feelings (not the usual return to work ones after a amazing holiday) came back, this was something different something I have not experienced before. I woke up on Monday morning and pushed myself to go in. I managed to walk the distance of what felt like 10 miles to the office door and my anxiety was enormous so I used my CBT techniques to help me. Took a deep breath and walked into smiling faces. The problem was I felt bad, I was struggling, can I do this? Is this me? I hear the same stories from before from colleagues! Is it worth It? I am strong but…… I can’t let people down. These thoughts I have not had for some weeks but now they are back, back with a bang. I thought it was day one so day two must be better. Still poor sleep, thoughts swirling round my mind. I was not good on Tuesday but I thought CBT you have to push yourself through the hard situation to make it better (not in all scenarios believe me!) I went to work, whilst driving there thought at every point I can turn around, curl up and hide away; i cried, something i do not do?and then i said no I told myself I can do it and so i carried on. On the motorway I cried again, struggling to cope. I pushed through! I then got to the office and did the same as the day before walked the 10 miles to the office door took a deep breath and went in. But it was different, I still had the warm greeting but I knew, I just knew I was relapsing so I stayed for a couple of meeting but I had to leave the office early I could not cope. I did the right thing. Now I see that. I came home spent time with Barney the puppy, the mother in law called round (she missed barney) I had a chat with her. With my mum and dad. With Julia. I agreed to see how I am today and make a decision. The decision to not go to work and to ring the doctor was immensley hard to accept and only with the support of Julia made me do it. To see sense that I have come along way, I have used all my effort to get out of the dark place I was in so why go back, why put myself through it to see if it helps. NO!! No job is worth it no matter how proud you are you have to accept sometimes it’s just not for you and that is ok. Author Daniel Buck.Posted on Apr 18, 2018 May 11, 2018 Categories UncategorizedTags #anxiety, #Depressed, #depression, #It'soknottobeok, #Men'shealth, #motivation, #samaritans, #suicide, Addiction, Alone, Anxiety in men, Ashamed, CBT, Depression in men, HelpLeave a comment on The journey begins.